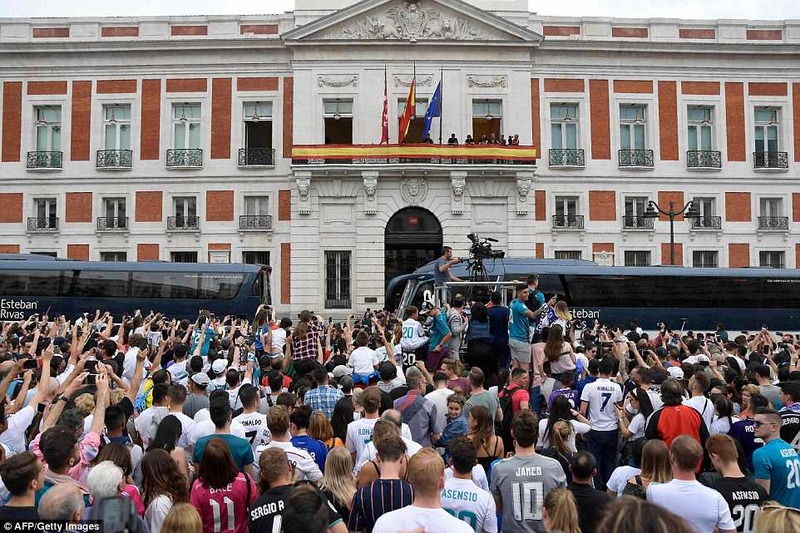 Real Madrid fans are getting used to Champions League title parades but the novelty will never rub off as they turned out in their numbers on Sunday to welcome their hero players back from Kiev. The Spanish giants beat Liverpool 3-1 on Saturday night thanks to a freak Karim Benzema goal and a double from substitute Gareth Bale – including a fantastic bicycle kick – at the Olimpiyskiy Stadium. 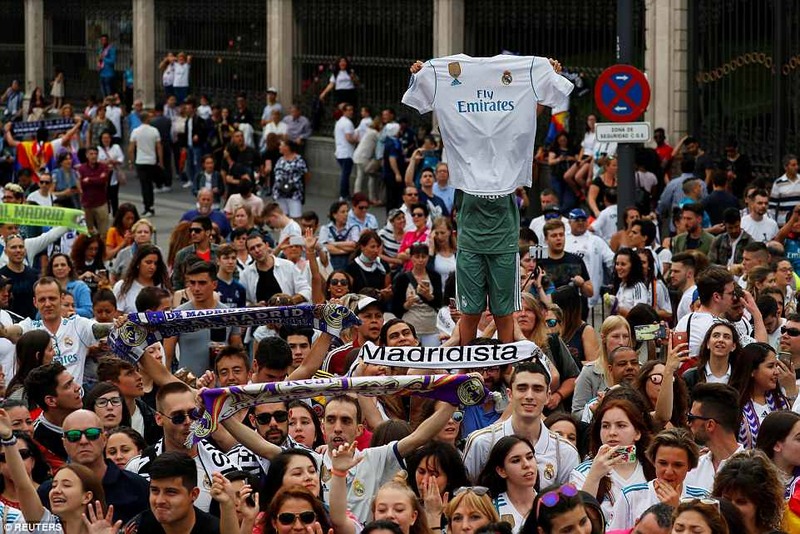 Despite being pegged back at 1-1 through a Sadio Mane tap-in, Madrid showed off their incredible winning mentality to claim their third straight Champions League triumph. 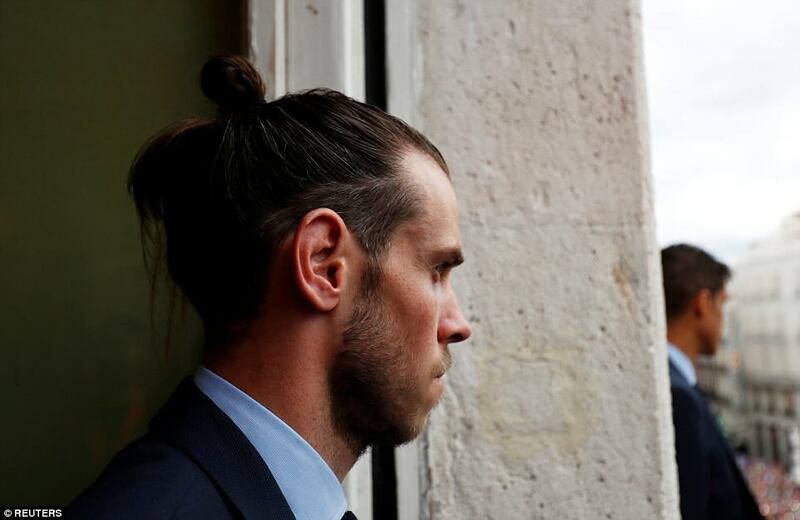 But Bale, who starred, was something of a misfit on Sunday. The Welsh star, who hinted at an exit in the summer post-match, was at the back of the bus and away from Real’s other key players. 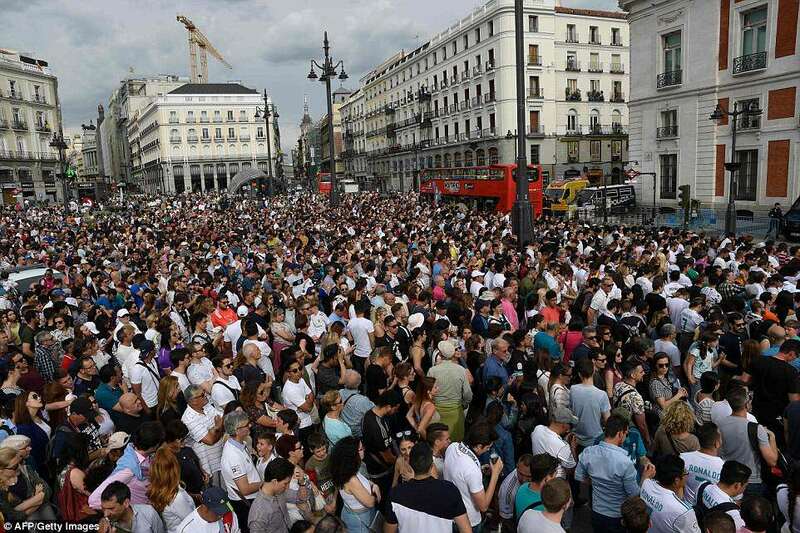 And on Sunday, ecstatic Madrid supporters turned up in their thousands to give their stars a hero’s welcome as they proudly paraded their 13th European Cup around the buzzing Spanish capital. 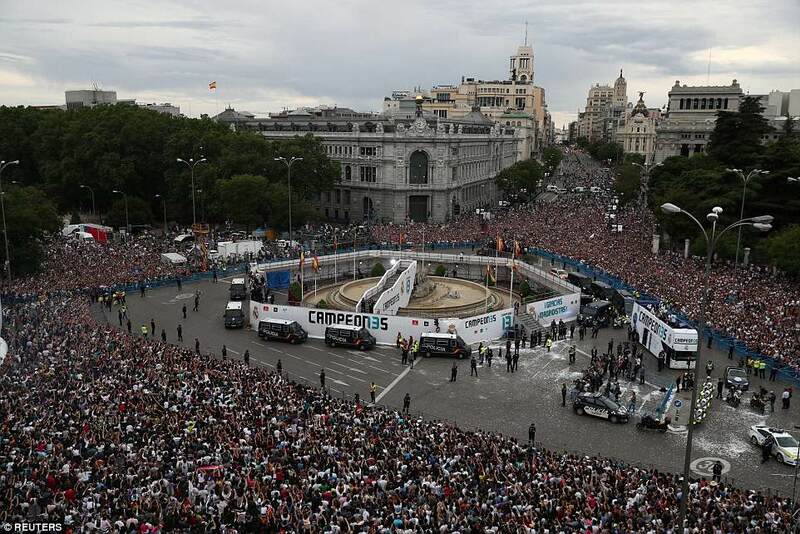 The likes of Cristiano Ronaldo, Casemiro, Marcelo and slightly subdued match-winner Gareth Bale were pictured arriving for the celebrations in sunny Madrid, with the former seen high-fiving the fans before the parade got underway. 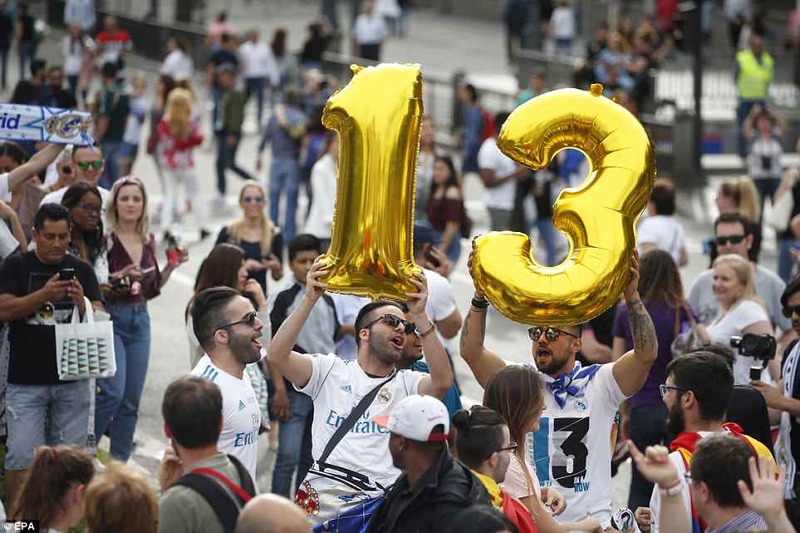 Two Madrid fans, who gathered at Puerta del Sol square in anticipation of seeing their heroes, went as far as bringing balloons which read ’13’ to show off the amount of European Cups their side have won throughout their history. 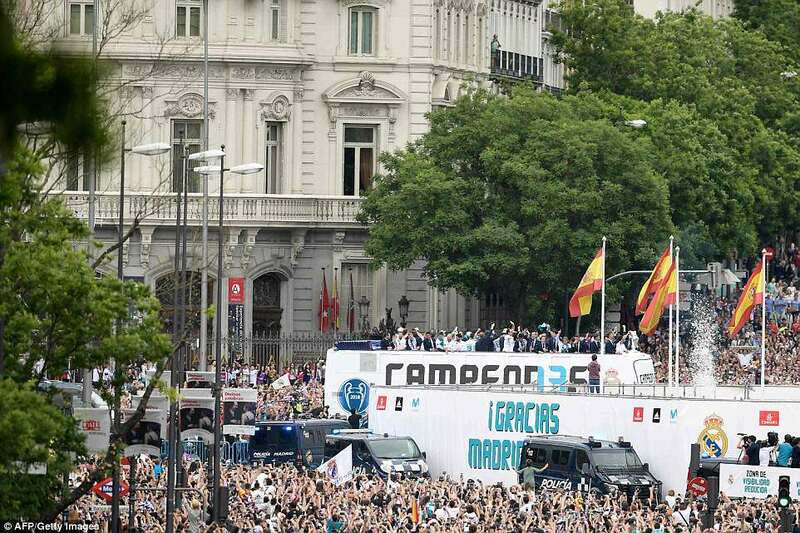 The players made their way to the square where the fans were gathered, parading the trophy from a balcony which overlooked the whole area. 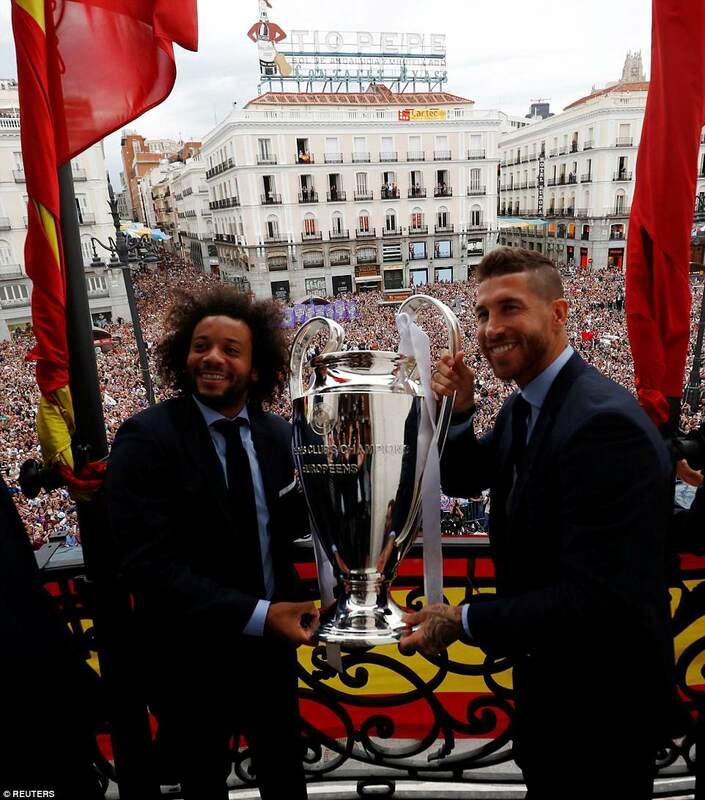 Madrid captain Ramos, who led by example yet again at the back, was seen proudly holding aloft the cup with Marcelo from the balcony in front of the supporters. 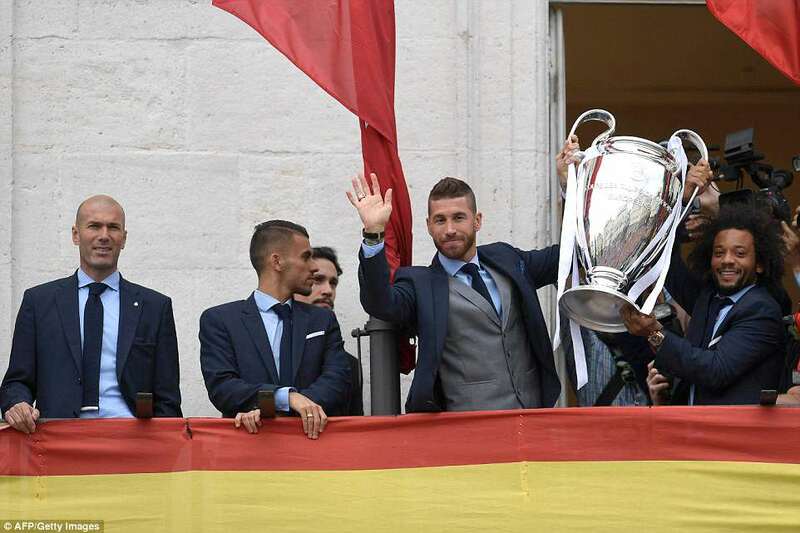 And Ramos had a few special words to give to the club’s fans, insisting the current team ‘are out of this world’. 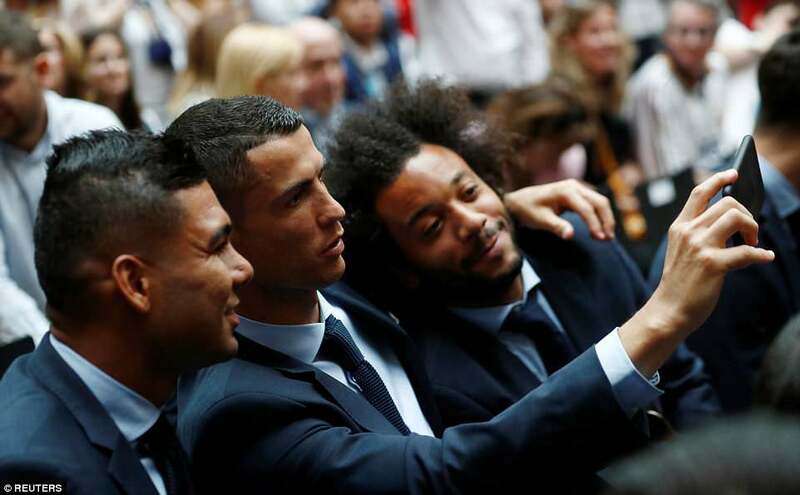 As the players showed off their silverware, club president Florentino Perez also addressed the crowd, claiming their latest triumph is ‘something unique and unforgettable’. 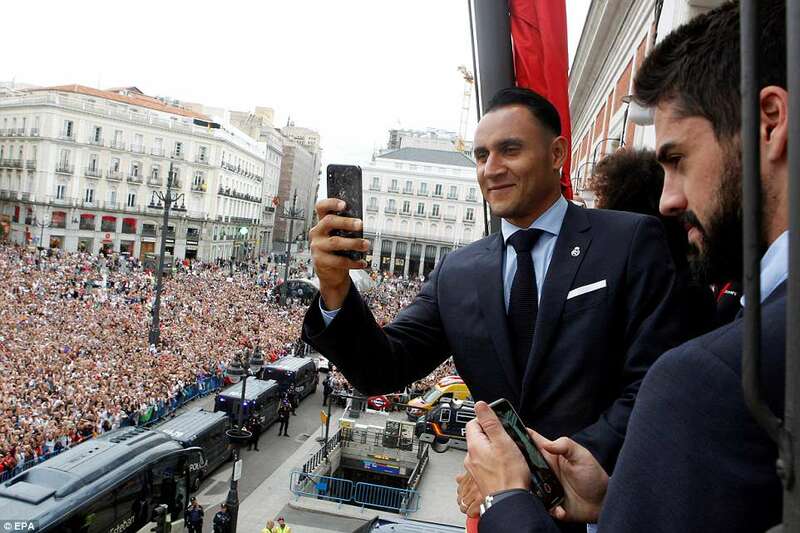 Perez said: ‘We continue to make history, I want to express my best wishes to Liverpool. This is something unique and unforgettable, it is something incredible in modern football. 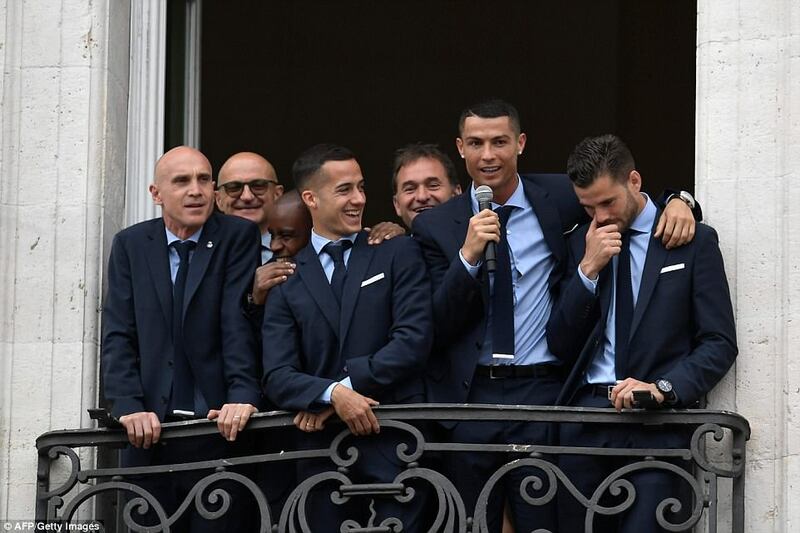 And Ronaldo, who dropped a big hint in the immediate aftermath of the victory claiming that he could be leaving the Bernabeu, thanked the fans for their turnout. ‘Thank you for coming today. 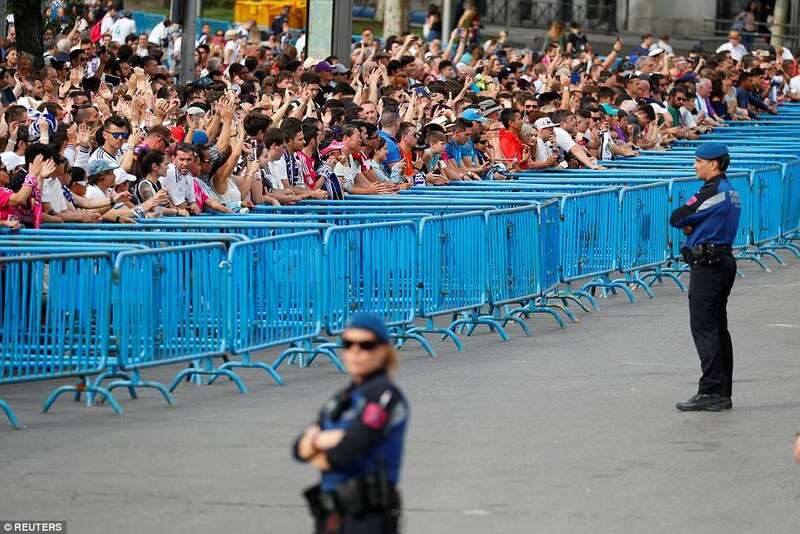 We have made history thanks to you who always support us. 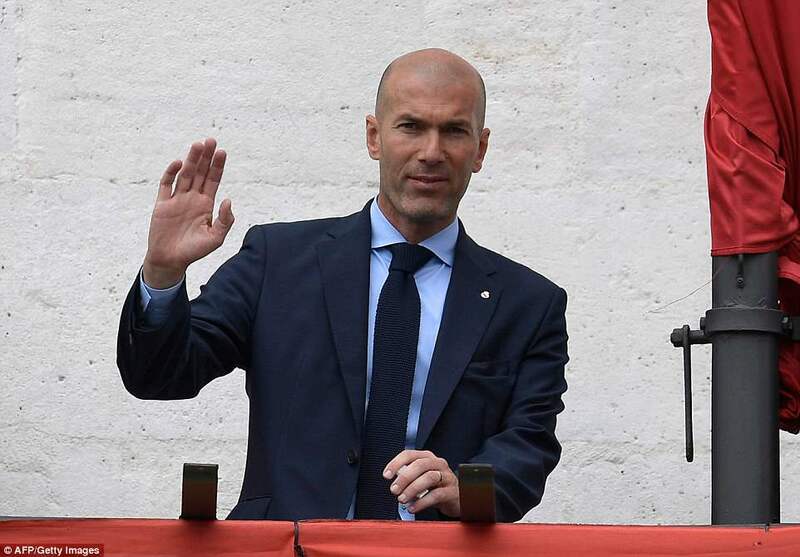 This is a moment to enjoy, hala Madrid,’ the five-time Ballon d’Or winner added. 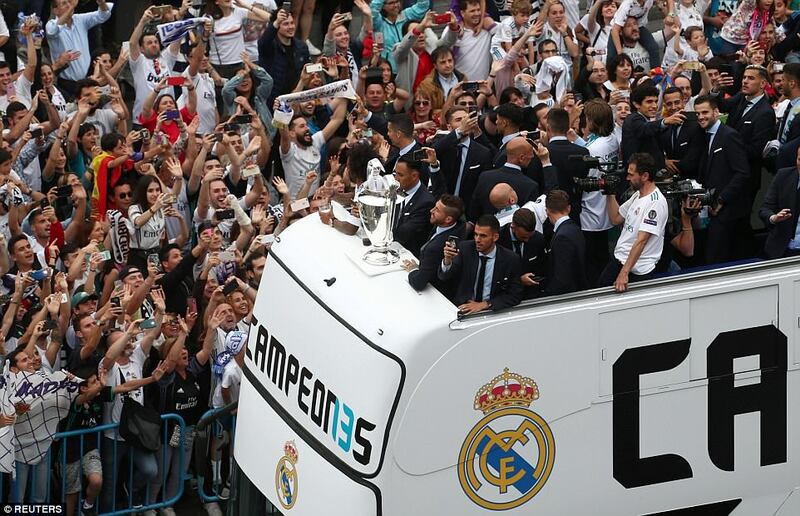 After showcasing their latest piece of silverware from the balcony, the Madrid squad then embarked on an open-top bus parade around the capital, with the Champions League trophy displayed at the front. 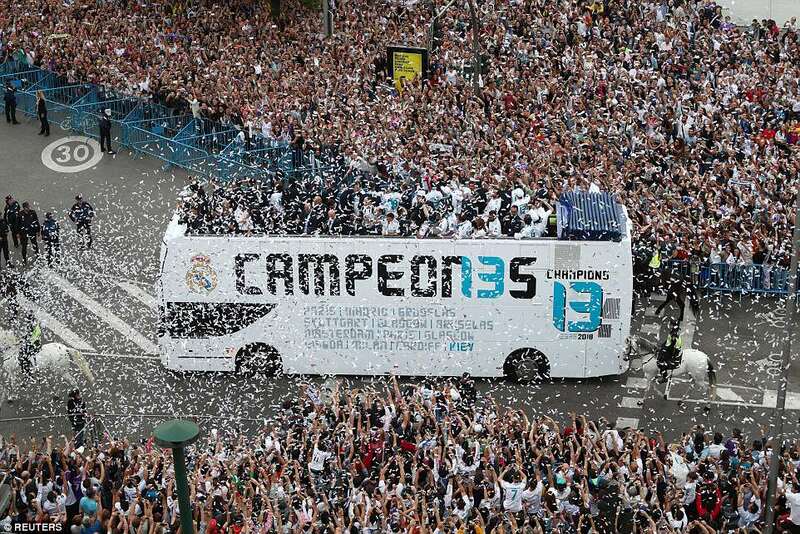 While both players and fans took in their overwhelming surroundings, white confetti was blasted all over the bus to make the occasion more colourful than it already was. 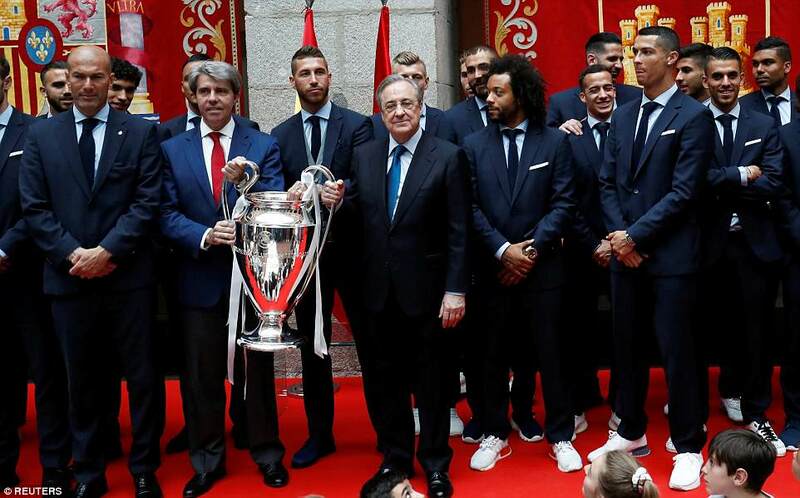 Following a tough domestic season, which saw them get off to a very sluggish start, Madrid ended the campaign in perfect fashion and have made the most of their latest triumph before heading their separate ways ahead of the World Cup in Russia.